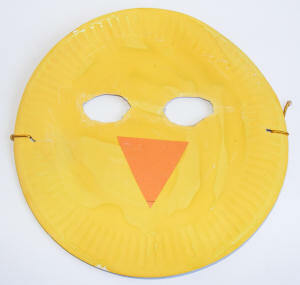 This chick mask combines painting, cutting out and sticking - and offers play value too! Paint the paper plate yellow and leave to dry. Cut out two eye holes. From orange card cut out a triangle for the beak. Glue the beak to the face. Make a small hole on either side of the mask, thread the elastic thread through and tie to secure. This little felt chick is a great craft for beginner sewers (or more experience sewers, come to that!) Wouldn't it be lovely making an appearance at Easter time?